How your organisation can benefit from the way it manages energy. Energy costs continue to be a major contributor to UK inflation and major energy users are more exposed to these cost fluctuations than most. In the current economic climate, organisations which use effective management techniques to control their use of energy are finding it easier to reduce this important contributor to costs. 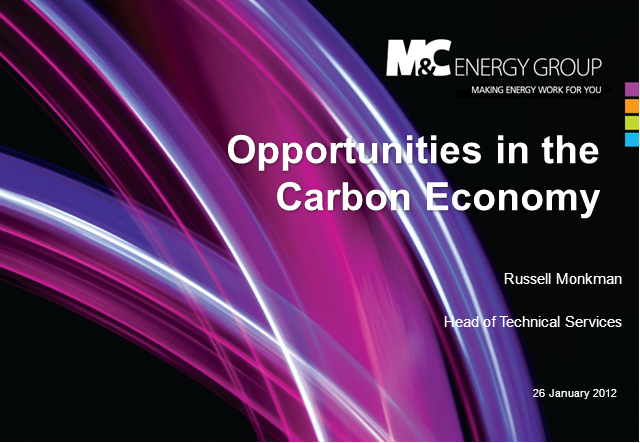 This webinar will highlight the opportunities of the Carbon Economy, will explain how effective Risk Management can be used to reduce your costs and will highlight the role that good Data Management support can play in helping you to take control of energy in your organisation. Our survey shows that sustainability is a priority for 7 out of 10 business leaders and the CBI estimates there is £20 billion potential in the market place. How can your business be a part of this growth in the economy? This webinar, produced by Sustainable Business and edie.net, will examine how businesses can create product transparency, formulate specific and measurable targets to tackle water footprint reduction, and improvement performance that can turn water risk into a competitive advantage. Considering and mitigating the water footprint of your business can reduce physical, reputational, regulatory and financial risks. And those companies that proactively respond to the challenge of global freshwater scarcity can turn that risk into an opportunity. Developments in the Waste Strategy have been long awaited and much debated. At best they could unlock some of the barriers to both waste and energy infrastructure development - at worst they could result in recourse to more debate, and a loss of vital inward investment. While the financial climate remains difficult, it's no surprise that many of those local authorities who are still to put residual waste solutions in place have had to take a step back to reconsider their options. But the UK cannot afford a protracted period of reconsideration if we are to deliver the required waste and energy capacity to meet targets and actual need. While last year's announcements proved to be a damp squib, early indicators suggest that these new changes will have a positive impact. Government energy policy has already identified EfW as one of a handful of technologies that are critical to delivering energy security and low carbon objectives. It is our belief, however, that if we are to deliver the full potential of EfW, we are going to need to exploit resources beyond the municipal sector, especially the energy value of residual Commercial & Industrial (C&I) waste. Joining up the dots of all of these combined waste and energy considerations, and taking into account planning and localism, is an enormous challenge - for government and for those working within the sector. Covanta is the largest Energy-from-Waste provider in the world, operating 46 plants worldwide. The company has more than 25 years' experience and treats over 18 million tonnes or residual waste annually from which it derives more than 9 million megawatt hours of sustainable energy. Covanta is making a considerable investment into the UK and Irish Energy-from-Waste markets, making up to 2 million tonnes of EfW capacity available over the next five years. Through this programme Covanta will be investing in communities, through job creation and community partnerships. During the ‘Proving Sustainable Practice’ webinar, you will have the opportunity to engage with Sustainability Experts, Consultants and organisations that have achieved NQA Sustainability Assessed Certification against the management scheme they have adopted to ensure ‘best sustainable practice’ is continuously delivered, reviewed and improved within their organisation. - The European Commission's call for higher priority to be given to reuse and recycling to ensure that, by 2020, all waste is managed as a resource that can then be fed back into the economy. Possibilities for waste-to-energy technologies such as Gasplasma are enormous in meeting the government's zero waste and renewable energy targets. The webinar will be presented by Rolf Stein, Chief Executive Officer, Advanced Plasma Power and Maxine Perella, editor of edieWaste. Rolf has worked in the plasma industry since 2006. Prior to his appointment as CEO of APP he was Chief Operating Officer for the company. He joined APP as Commercial Director with a particular focus on securing and commercialising the company's intellectual property portfolio. Before working in this industry, Rolf had extensive international experience holding senior positions in large multi-national technology companies including Hewlett Packard and Apple. Rolf has a law degree from the University of Warwick and is qualified to practice law in both the UK and Germany. Edie.net helps people make business sustainable. Sign up to our series of interactive webinars, to share knowledge and ideas with thought leaders in sustainability across the private and public sectors.